Port Townsend, today. 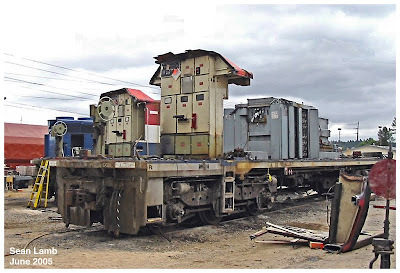 Whilst researching the reorganization of locomotive repair and refurbishing companies here in the Pacific Northwest, (see previous post,) I discovered photo of GF6C BC Rail 6003, being dismantled at Coast Engine and Equipment Company (CEECo) at Tacoma. BCR 6003 was one of only seven engines of this type GMD ever fielded. She, like CEECo, was one of a kind. 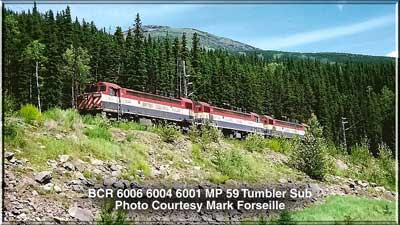 We told the complete story of BC Rail and the GF6C’s in “Tacheeda, Bullmoose & Quintette.” It’s a three-part story, with the GMDL-DD GF6C being detailed in Part Two. And it's tough to look at the remnants of such a magnificent machine, who staked out an important chapter in electric locomotive design. In June of 2005, Sean Lamb caught this deconstruction scene at CEECo at Tacoma, now also deceased. Many times when we look at photos like these, looks like so much stuff. But these are key components, the heart of what made the GF6C so unique, so I labeled them for you. * The parking hand brake was located inside the nose door. Behind it was a “super-duper-pooper” compartment. * The “S7 cabinet,” weighs almost two tons. It formed the rear wall of the cab, separating the cab from the machine room. It was control central for all the “hot stuff.” The 74-volt panel, the 120/240-volt panel, the 480-VAC panel and the Locomotive Control Panel, which included lights, fuses, isolation switches, dynamic brake and miscellaneous switches and fuses. * The Main Transformer, weighing more than 17 tons. Processed incoming 50kV 60Hz current. * The Thyristor Rectifier Cabinet, including the smoothing reactor, weighing another 3.85 tons. Here, ac was converted to dc, and “smoothed” before being divided and fed to six three-ton dc traction motors! When you think about it, an electric locomotive really isn’t a “locomotive” in the classic sense. It is nothing more than a shoebox on wheels, processing incoming electrical current and distributing it to a group of axel mounted traction motors. Thankfully, one GF6C narrowly escaped deconstruction. She’s on display in Prince George, BC. And we related CEECo’s fate below. Another very interesting post, thanks! IIRC one of these units was on display outside of Expo 86 in Vancouver, the only time I've seen one in person. Is the 6001 a complete locomotive or a shell? All seven GFC6’s were released back to their owner, CIT Leasing, as soon as the Japanese commitment was declared closed. They ended up on a siding in New Westminster, at the southern edge of Vancouver BC in October 2003. In November they were moved across the border and stored in Everett, awaiting movement to Tacoma. 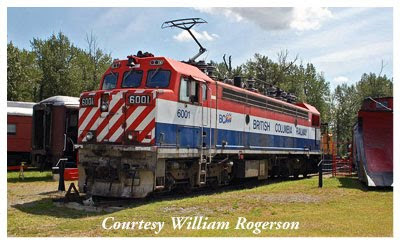 All during this time, members of the West Coast RR museum in Squamish, and others, were frantically trying to find out if any of the units could be donated or sold to them. Finally in February 2004, they were given literally a month to raise funds for their pick of the pack before movement to CEECo. If you’ve ever belonged to one of these restoration groups, you can identify with what they were going through, even finding the right people to talk to! 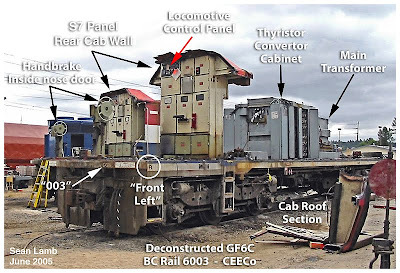 To specifically answer your question, despite all the open venues these units were stored at, the 6001 finally arrived at her final venue in Prince George, fully intact except for a missing headlight, four air hoses, an amp meter, and number boards! The 6001 in Prince George is completely operable... The museum manager said that if they had access to 50,000 volts of electricity, they could power up the 6001. But that won't be happening any time soon, lol.